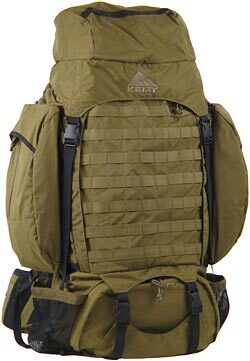 These limited-production packs were manufactured by Kelty Pack Inc. for Amron International Inc. and were available through several distributors, including Amron Intl, Botach Tactical, and US Elite Gear. The first four packs (Gila, Klamath, Arctic Fox, and Kodiak) were sold non-exclusively by Amron Intl from 2004 to the end of 2005, with the exception of the Gila, which was offered until mid 2006. The Jackal 5500 was only featured on Amron's site in 2005. The average sale price was around $550 for the first four packs on their introduction, being reduced to around $300-$250 after production ceased. (The MSRP of the Gila 6500 was listed as $396.00 on Amron's site in July 2006.) The Jackal 5500 was offered for $275 through Amron Intl. "As far as issue goes - we only sold to distributers at the time the Gila was in production (i.e. Amron, US Tactical, ADS) and they would typically get a bid and then purchase from us or stock inventory in some cases. I couldn't tell you who it was issued to at the end level." The following product descriptions (excluding the Shadow 7203 write-up) are from Amron International. 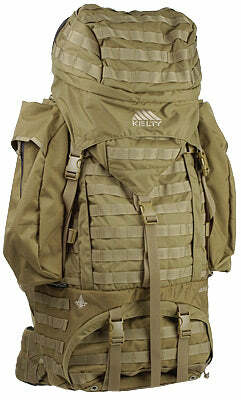 The Gila 6500 the first of four large capacity military backpacks by Kelty & Amron International, designed as an extended range desert operations pack. Load capacity (weight) 125 lbs. Features an internal RT pouch w/antennae & handset access, top load, bottom load and panel load capability, removable top-lid with double entry compartments seconds as a large waist pack. Sleeping bag compartment has zippered shelf which will fit a 0°F sleeping system. Hydrophobic Super Space mesh on back-panel & shoulder straps insures breathe-ability and moisture transfer in hot & dry environments. Construction is of 1000 D Kodra, double stitched. Hydration system compatible (not included). Waist belt incorporates Scherer cinch system and Kelty back-balancer waist "plate." Removable, replaceable and fully adjustable Mystery Ranch suspension system. Load Levitator compatible, a highly engineered pack-to-belt load transfer device. • Pack capacity: 6500 cu. in. • Torso size: 16" ~ 21"
• Pack dimension (stuffed): H-38" x W-14" x D-9"
• Side pocket: H-15" x W-8.5" x D-3.5"
• Front pocket: H-15" x W-16" x D-3"
• Top lid volume: 660 cu. in. 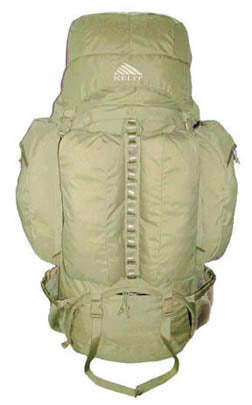 The Klamath 7200 the second of four large capacity military backpacks by Kelty & Amron International, designed as an extended range (cold weather) operations pack. Load capacity (weight) 125 lbs. 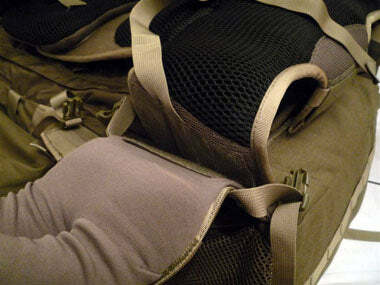 Exterior front pockets (Gila 6500) have been removed and replaced with spaced nylon webbing (tone on tone nylon on production models) enabling the mounting of tactical accessory pouches (not included). Features an internal RT pouch w/antennae & handset access, top load, bottom load and panel load capability, removable top-lid with double entry compartments seconds as a large waist pack. Sleeping bag compartment has zippered shelf which will fit a 0°F sleeping system. Hydrophobic Super Space mesh on back-panel & shoulder straps insures breathe-ability and moisture transfer in all environments. Construction is of 1000 D Kodra, double stitched. Hydration system compatible (not included). Waist belt (32") incorporates Scherer cinch system and Kelty back-balancer waist "plate." Removable, replaceable and fully adjustable Mystery Ranch suspension system. Load Levitator system compatible, a highly engineered pack-to-belt load transfer device is included. Aluminum "U" tube inside stays, aluminum plate suspension stays. • Pack capacity: 7200 cu. in. 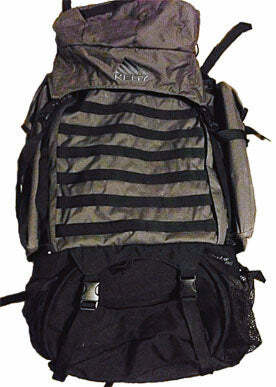 • Pack dimension (stuffed): H-38" x W-15" x D-9.5"
• Pack capacity: 7250 cu. in. 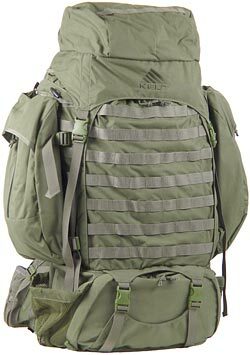 The Kodiak 7200 the fourth in a series of five large capacity military backpacks by Kelty & Amron International, designed as an extended range (cold weather) operations pack. The Shadow 7203 is an exceptionally rare pack, produced in a gray/black color scheme intended to excel during nighttime operations. Never offered for commercial sale, only a small handful are believed to have been produced for at least one special operations unit operating in Afghanistan in 2003. The design is likely identical to that of the Klamath and Kodiak rucks, and no model/date tag is attached to the pack. The Jackal 5500 backpack is based on a production version of the Gila 6500 that's been highly modified to serve as a medium-range combat-patrol pack. It's built around the fully adjustable CloudLock suspension system, newly designed to handle military loads up to 130 pounds. The Jackal project went through many months of test and evaluation by uniformed military personnel prior to its summer 2004 release. The majority of the field testing was conducted by reconnaissance and raid-type units. A well thought-out and planned patrolling platform, the Jackal is a front-panel loader with additional access to the main bag compartment from the top or bottom. Spaced nylon webbing across the complete exterior enables the mounting of tactical accessory pouches (not included) and equipment. A newly designed, removable top lid doubles as a waist pack, or can be mounted to the front of the shoulder straps for carrying on the chest. 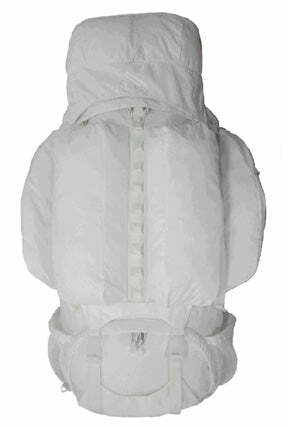 A lower zip-up/zip-down shelf within the main packbag supports a moderate-temperature-rated sleeping bag. A redesigned internal radio pocket now supports various man-pack configurations and models. Inside the panel flap, there are additional mesh cargo pockets specifically requested by corpsman, medics, and squad first responders. The Jackal has additional compression straps, both internal and external, to better accommodate missions of this type and duration. Large drainage grommets are located on the bottom corners of the pack. Additional haul loops/handles have been added to the lower half on each side, as have carrying handles on the top and bottom. On the back panel and shoulder straps, we used the same Hydrophobic Super Space Mesh found on all other pack models (Klamath, Gila, and Kodiak). 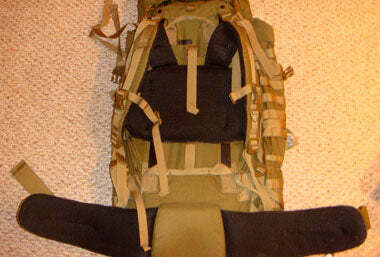 The shoulder straps have been lengthened to accommodate vests, chest rigs, and armor systems. • Pack capacity: 6050 cu. in. • Torso size: 15" ~ 22"
• Pack dimensions (stuffed): H-43" x W-23" x D-13.5"
• External side pocket dimensions: H-15" x W-8.5" x D-3.5"
• Top-lid volume: 650 cu. in. The frame of these packs is a modified version of the Mystery Ranch System Wrapframe that was licensed to Kelty in 2001 and is found on three of their civilian packs: The Roswell 2300, Yeti 4300 and Bigfoot 5200. The licensed frame is a modified version of Mystery Ranch's Wrap Frame (two words). This adjustable, moldable external frame consists of HDPE plastic and Kelty's .75" wide LightBeam aluminum stays, in addition to hook and loop sections and an anodized aluminum "U" stay that links the upper section of the frame to the lower. The packbag contains a 11/32" diameter anodized aluminum tube stay that spans the perimeter of the pack. This perimeter stay helps the packbag maintain its shape and provides support for the frame's load lifter straps. A copy of Kelty's Wrapframe manual can be DOWNLOADED HERE. The lower sides of the frame - what are known as the wingtip stabilizers - comprise the principal attachment method, connecting the frame to the bag's integrated hipbelt via hook and loop and cinch straps. A fiberglass tube runs vertically through webbing on the back of the Wrapframe and attaches inside of two plastic caps (what Mystery Ranch calls “Terminator buckles”), each of which are linked to a horizontal aluminum stay that is integrated into the back of the packbag. The fiberglass tube is designed to help transfer the weight of the pack to the hipbelt and help the frame and pack maintain their shape. Side release buckles attach the sides of the frame to the packbag. A lower hook and loop platform with cinch strap connects the bottom of the frame to the bottom of the packbag. 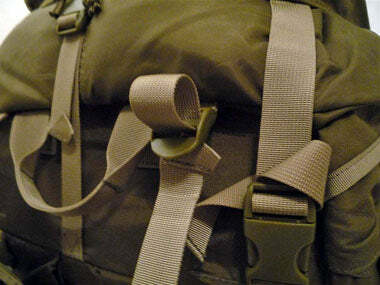 The load lifter straps are routed through the ladderlock buckles on the back of the packbag. There are two sets of buckles set at different heights on the packbag to allow the load lifter straps to be at an ideal angle depending on the adjusted length of the frame. The padding on the military version is thicker and more resilient BROCK 3D air-circulating foam, as opposed to the Spacermesh found on the civilian model. The civilian Wrapframe features adjustable shoulder straps that can be lengthened via a hook and loop strip at the top of each strap. The military shoulder straps are a fixed length. There is a horizontal aluminum stay added to the lumbar region of the military frame that is not present on the civilian model. I suspect this was added by Kelty engineers to help the frame support a 125 pound load rating. The civilian frame features a buckle in addition to the ladderlock cinch strap for attaching the fiberglass tube support straps to the packbag. This buckle is absent on the military model. The civilian Wrapframe was available in short and regular torso lengths. The military model was only available in one size. There are several design flaws that plague the Kelty-modified Wrapframe and Gila pack series. Kelty engineers added a horizontal aluminum stay to the lumbar region of the Wrapframe, which prevents the frame and hipbelt from properly wrapping around the hips. This causes a clamp-like effect when the hipbelt is tightened and prevents the pack from riding correctly, though heavier individuals may not experience this. Unlike the Mystery Ranch equivalent, the lower section of the Wrapframe features straight, rather than curved aluminum stays. For most users, this means the frame does not correctly fit the contours of the spine. The flaw that most affects the function of the pack system is the improperly positioned fiberglass tube. This tube was designed to bear some of the weight of the pack and is to make contact with the lower hook and loop section of the frame. 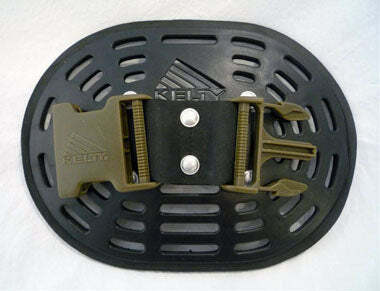 Kelty positioned the lower terminal of the fiberglass tube and its accompanying aluminum stay several inches above the bottom of the hipbelt, preventing the lower hook and loopplatform from properly making contact with the plastic tube housing. This causes the packbag to sag on the frame while in use, which pushes the wingtip stabilizers and hipbelt upward. The result is a pack that sags on one's lower back and a hipbelt that pushes up against the rib cage and cannot be properly cinched over the iliac crests. The Jackal 5500's frame is a modified copy of Kelty's CloudLock suspension system, which is similar or identical to the frame found on some of Kelty's current tactical packs, such as the Eagle 128 (formerly known as the Eagle 7850) and the Falcon 66 (formerly known as the Falcon 2850 and the Falcon 4000). A copy of Kelty's CloudLock manual can be DOWNLOADED HERE. There was a news article published in 2001 or 2002 about the Kelty Gila 6500, though the article is no longer available online and I do not recall the name of the publication. The headline was something to the effect of, "Uncle Sam Outfits Troops with Gila Pack." The article outlined that a requirement was laid out for a pack weighing less than 10 pounds that could "comfortably" carry 150 pounds. Kelty has no information available for these packs - nothing. The explanation I received was that they moved offices and many old documents were misplaced. It's because of this lack of information, combined with the rarity and complexity of these packs, that I compiled all available information into a thorough review of the pack suite. There were improvements made to the Gila 6500, with the unlikely inclusion of the Klamath 7200 and Kodiak 7200 as well (I have never seen either model), which are denoted by a '3' designation (Gila 6503, Klamath 7203, and Kodiak 7203). The primary improvement between the '0' and '3' models is the addition of two horizontal main compartment compression straps on each side of the pack. Additionally, the Gila 6500 top lid is of slightly different construction, featuring no Kodra skirt on the back portion and single large opening that was later changed to the "double door" found on the Klamath 7203, Kodiak 7203, and Jackal 5500 packs, as well as the Gila 6503. (It is worth noting that I have seen Gila 6500s with the "double door" top lid.) The sleeping bag compartment access trim includes an integral piece of elastic on the Gila 6500, whereas later '3' models feature an adjustable shock cord with cord lock. The '3' designation represents the year the improvements were implemented (2003). These packs were primarily constructed of 500 denier and 1000 denier polyurethane-coated Kodra nylon, a fabric similar to Cordura nylon, manufactured in Korea by Kolon International. Low-wear areas of the pack, such as the back portion that rests against the frame and the back of the removable side pockets, are constructed from a heavy, polyurethane-coated Oxford-type fabric, that feels around 600 denier. Urethane-coated YKK water-resistant coil zippers (which range in size from #10 to #5, depending on location) are used externally, with standard zippers used internally. Virtually all seams are double stitched and taped with grosgrain ribbon, with the exception of the front pockets on the Gila 6500, which are single stitched and not taped (the front pockets on the Gila 6503 are double stitched but also not taped). Overall, the construction quality of these packs is excellent. "The large black piece is what we called a 'Back-Balancer' (or Kelty Rodeo Belt Buckle) that was supposed to help distribute the load across the front of the abdomen and was an option several years ago (not standard issue) and you can use the pack without it." "The spring-loaded gizmo is a 'Levitator' that is like a leaf spring stabilizer for large loads. Those packs are made to use up to quantity two on each side depending on the load, thus the two insert locations. I would use the outside one if you are just using one set." The following is from the Kelty 50th Anniversary Pack instructions. The Levitators are best for loads of 35lbs and up. The Levitator effect is adjusted by tightening or loosening the diagonal webbing strap shown in Figure 16. 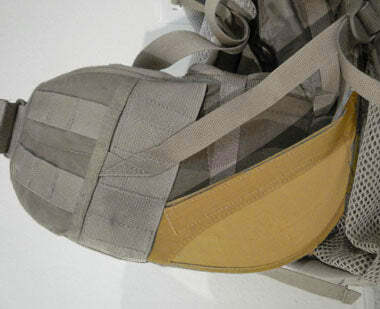 Tighten the webbing strap to reduce bounciness or pack lean. Loosen the webbing strap for high loads and maximum freedom of movement. From my observations, The Gila 6500 and Gila 6503 are the most produced packs in the suite. Second is the Kodiak 7203, followed by the Klamath 7203 and Jackal 5500. The Klamath 7200 and Kodiak 7200 do not appear to have been produced, and believe those models were only made with the '3' improvements. The Arctic Fox 7250 is exceedingly rare and I'm unsure of how many, if any, of these packs were sold or manufactured.